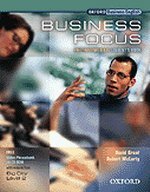 Business Focus is a course for working people who need to communicate in English immediately. The syllabus is built around the functional needs of students: unit headings include 'Making contact', 'Sharing information', and 'Dealing with problems'. The units concentrate on activating language. Units feature games, role-plays, and special discussion sections, Focus on Business Issues. Communication is aided by key words and key expressions appearing at the bottom of each page, for easy classroom reference. Every Student's Book comes with a FREE CD-ROM including video clips from OUP's business video series Big City. The CD-ROM also includes a bank of email writing phrases, and audio recordings of each unit's wordlist to aid students in pronunciation.